The story: In church just over a week ago and the sound engineer arrived 2 minutes before the service started, way too late to do a soundcheck. When the first hymn started he discovered he had no signal from the keyboard (organ). He got the guitar player to check that all the right cables were in place and in doing so he accidentally knocked the guitar such that it fell forwards. It is the first time I have seen a head break off. I watched it all happen in slow motion as I sat only a metre away at the drums but I couldn't manage a superhero leap over the drums to grab the guitar before it hit the deck. Talk is of getting it repaired; apparently this is the third time it has happened to this Cort guitar. Yes. It can be repaired. 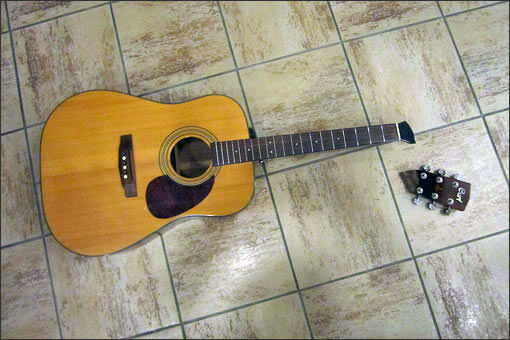 I had a guitar similarly broken which was fixed with glue. Any experienced luthier can fix that. If the grain is such that it's a repeat break, then splines inserted at the back with the grain running across the break will prevent any further repeat. It might be a question of economics at this stage, how much is a used Cort worth to the player and would another be a better bet. The weak grain area is different for each individual neck and this one sounds suspect. The splines would fix it but is the cost equal to the value? Real bummer for the player though. I watch my Gibson because they suffer the same grain weakness. I've got away with it since 2006 so maybe it's a good one! I am particularly careful with my Epi Les Paul for that very same reason. When you said it was the third time for that guitar, I immediately wondered how good the repair was. Whether it was done professionally or whether the guy just glued it together with what he had to hand! Use a couple of brackets and wood screws. A friends Les Paul suffered the same fate while inside the hard case. He thinks it might have been knocked over, but he’s not sure. Anyway, it was a nice clean break and I glued it with Evo stik wood adhesive, which I’ve used for several guitars. After clamping it well and waiting way pat the time suggested on the glue bottle, it seems to be holding up well. Don’t believe the voodoo about using unicorn bone glue or something. Just glue it. Wood is wood! No wonder most people call it a break angle at the headstock. Especially Gibbo's 17 degree angle. I paid good money for my Unicorn Bone glue. You know you've made it as a great guitarist when damage like that (and leaving it so) INCREASES the value of the guitar. Jocko the Epiphone les paul has a scarffed on head, so the weak cross grain does not apply. Thats something fairly unique to USA made Gibson who have the cross grain at the narrow point and then hog out the wood for the truss rod nut at the same place! But it is traditional though. Good to know. Does anyone want to buy my Unicorn Bone glue, since I won't need it? I’ll trade you a can of badger spit nut lubricant.